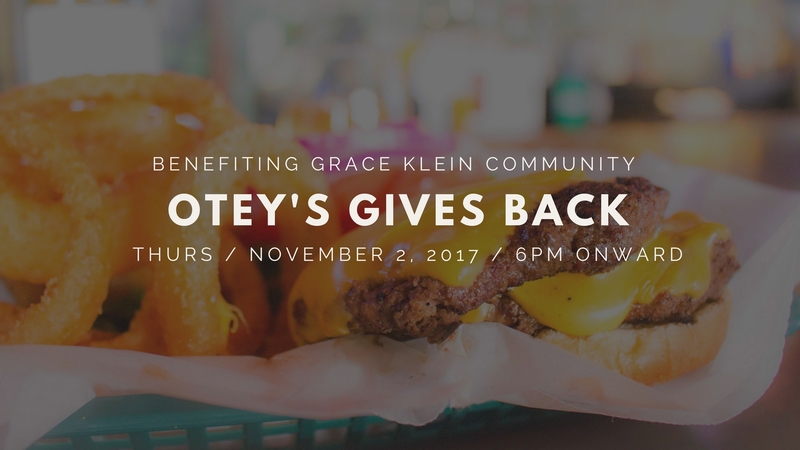 On November 2, 2017, Otey’s Tavern will be donating 10% of all sales from 6 pm to 9 pm to Grace Klein Community. Grace Klein Community is a local 501(c)3 non-profit that seeks to unite all people to work together to serve those in urgent need through such avenues as food, clothing, relationships, and hope in the Birmingham area. Otey’s will have special guests at the bar that night as well as a donation box for new or gently used coats, gloves, jackets, scarves, and toboggans. Come join us for an evening of fun and be sure to bring a donation that will keep a friend warm this winter. Perhaps you have other commitments that night, or maybe the location is inconvenient for you. If you would like to contribute, consider making an online donation of the price of your meal to the local ministry efforts of Grace Klein Community. Your gift will be used to help provide relief to the poor, the distressed and the underprivileged. Show the love Birmingham!